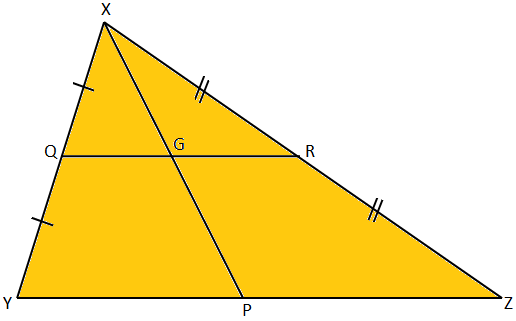 Here we will prove that any straight line drawn from the vertex of a triangle to the base is bisected by the straight line which joins the middle points of the other two sides of the triangle. Given: Q and R are the midpoints of the sides XY and XZ respectively of ∆PQR. P is any point on the base YZ. QR cuts XP at M.
To prove: QR bisects XP, i.e., XM = MP. 1. By the Midpoint Theorem. 2. In ∆XYP, Q is the midpoint of XY and QM ∥ YP. 3. By the converse of Midpoint Theorem.